A well presented two bedroom terraced house located within easy walking distance to the main line railway station and town centre making this ideal for commuters, first time buyers or for investment. 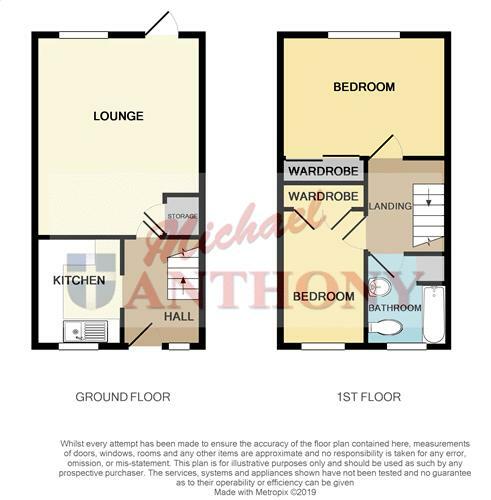 Property comprises entrance hallway, kitchen, lounge, two bedrooms, bathroom, double glazing, gas central heating, garage and private enclosed rear garden. Viewing highly recommended. Aspect to rear, double glazed door to garden, radiator, door to understairs cupboard, coving to ceiling, ceiling spotlights. Refitted 2016 - A range of storage cupboards at base and eye level, single drainer sink unit with mixer tap over, complementary tiling, plumbing for a washing machine, concealed gas Combi boiler refitted in 2016, four ring gas hob with extractor hood over, fitted oven, glazed tiled flooring. Double glazed aspect to rear, radiator, coving to ceiling, eyeball ceiling lighting, built in wardrobe, radiator. Aspect to front, radiator, coving to ceiling, built in wardrobe. A white suite comprising a panelled bath with central mixer tap and shower over, low level w.c., pedestal wash hand basin with mixer tap over, complementary tiling, chrome heated towel rail. Situated to the rear of property. Laid to lawn, picket fencing. Rear access, timber decking area, lawned area, timber shed.